John Henry Davis was born on January 12, 1921, in Smithtown, NY. He grew up and rose to weightlifting fame in Brooklyn, NY. 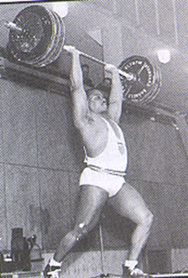 John won the US Nationals 12 times, set numerous world records, won 6 World Championships and 2 Olympic Games. 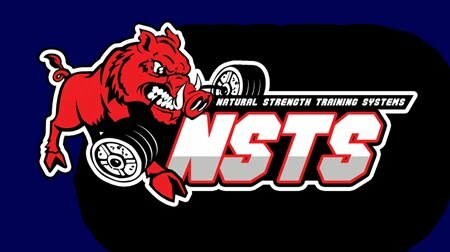 At the Weightlifting Nationals of 1941 he became the first man in history to exceed 1,000 pounds in the three-lift total. 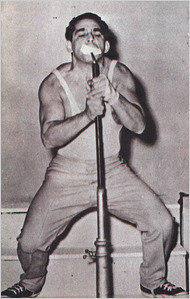 Davis made 1005, breaking Steve Stanko's historic 1,000-pound American total record that had been set in April of 1941. On January 11, 2010, Joseph Rollino known as the Great Joe Rollino, the Mighty Joe Rollino or the World’s Strongest Man passed away after being struck by a van while out for his daily five mile walk. The 104-year-old Brooklynite, who once lifted 635 pounds with one finger and lifted 475 pounds with his teeth, who once lifted 3,200 pounds at Coney Island during its heyday was still bending quarters with his fingers at age 104. During his storied life, Rollino hobnobbed with Harry Houdini, watched Jack Dempsey knock out Jess Willard and was friendly with Mario Lanza. He even had a bit part in "On the Waterfront."